These are memory wire rings with calavera beads. I made these beads with polymer clay and UV resin. Looks gem stone? 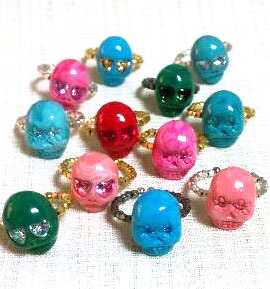 Actually I was looking for some nice gem skull beads but couldn’t find what I want, then started to think of making by my self. Tried many times with various materials and finally done! I think it’s not too bad, hope you to like them!